Every now and again you run across a recipe that you just HAVE to drop what you’re doing and make – like right NOW. This Pizza Hummus is one of those recipes. So before I go any further, let me just say Thank You to Kathryn McCormick on the Vegan Meringue Facebook Group for the inspiration for this amazing recipe. This recipe is so simple it’s genius! I mean come on…..hummus that tastes like pizza? Use it as a dip for veggies, smear it on some healthy crackers for an afternoon snack, or as a spread for a raw veggie sandwich. However you use it, one thing is for sure – it’s not going to last long. Drain one can of chickpeas, reserving the juice. You might want to save this juice for another recipe so don’t just pour it out. Apparently this magical elixir is taking the vegan world by storm and even has its own name – aquafaba. Aquafaba is being used as the perfect egg replacer and whips up the prettiest meringues you’ve ever seen. Who knew this liquid we’ve all been dumping down the drain could be used to make everything from incredibly chewy brownies, pies, even mayonnaise? Weird huh? Look it up – it’s all over the net. Anyway, add your chickpeas, garlic, lemon juice, tomato paste, and all your spices to a food processor or blender, and process until it’s smooth and creamy. If you need more liquid, add 1 Tablespoon at a time of the reserved bean juice to get the consistency you like. I used about 4 Tablespoons and mine came out perfect. I told you this was insanely easy. And the pizza spices just moved this everyday Hummus recipe to the top of my “I have to eat this everyday “ list. I know a lot of you are not fans of Nutritional Yeast – but seriously combined with the tomato paste it adds a “cheese pizza” kind of flavor you may not get without it. 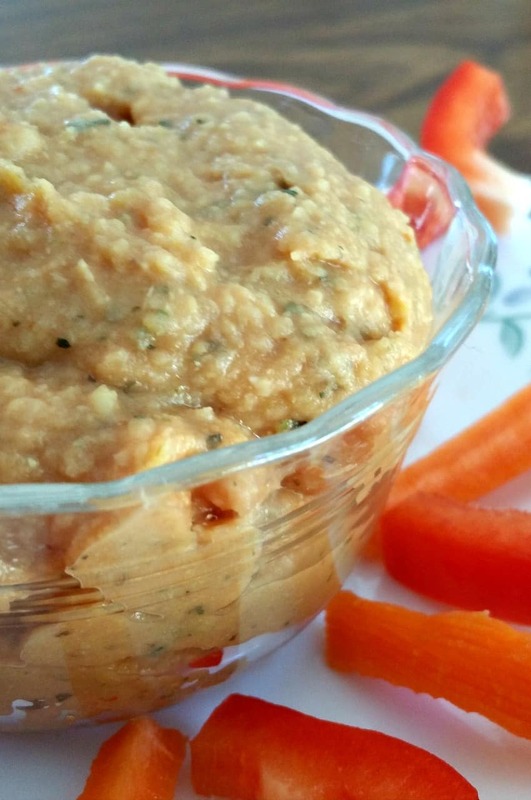 A smooth creamy fat-free hummus dip with the addition of tomato paste and pizza spices that will be sure to please. Pizza Hummus? Yes please! Chuck….I have just made the decision to work very hard at staying committed to the Esselstyn way of eating. I stand in awe of your accomplishments and your devotion to this extraordinary blog! You make everything seem easy to stay on program/ lifestyle and the variety of your dishes and creativity in cooking just amaze me. Thank you for being there for people like me who struggle at staying on program but yet desperately want to. I cook for one and I’m going to use many of,your recipes to take one day at a time. Thanks again so much! Thank you Barb! Glad I can help! I just wanted to agree with Barb. Your tamales are my absolute favorite. I always look forward to what you post. Yes it is generous people like you who are such a help to stay on the path to eating for health. I’m sure you get lots of nice notes but one more might just make this day better. Thank you..
Just made this – it’s delicious! I substituted lime for lemon and reduced to 1 tbsp (I find most recipes have too much citrus for me) and it’s perfect. Thanks for sharing. Big hit for 3 out of 4. Thank you! I am short on snack recipes. This helps. Mmm, that garbanzo bean juice! I cook my own garbanzos and home and at the end, after packaging my cooked garbanzos, there’s always a gloppy, luscious juice with SO much flavor. I slurp it up by the spoonful, but now I am TOTALLY going to try whipping it up to a froth. Mmmm. Why has no one thought of this before? It turned out great, well, as great as my 20+ year old food processor can make it. Maybe a touch too much liquid, but that’s on me, not you. water bean may be a literal transliteration, but is not the correct translation, which is bean water (or bean liquid). subjects and modifiers in different order in different languages. Kinda like mama mia -> my mother. I made this tonight. It was easy and yummy! I didn’t have lemon juice so I added a bit of apple cider vinegar. Otherwise I made it as written. I had to add a lot of bean juice to get it to mix. Way more than 4 Tbs. Just made this – it was quick and easy. I was attracted to this recipe because my husband LOVES pizza so much. Followed the recipe pretty much to a T, although I added a 4th garlic clove because we do that with everything. Only other difference is that I used basil from a squeeze tube rather than dried basil. It was probably more like at least 4 teaspoons. As a result I only needed one tablespoon of the leftover juice. Delicious! We will certainly make this more often. The other thing that is great about this recipe is that we generally have all of these ingredients on hand so it’s great for spontaneous events like drop in company etc. Pizza Hummus??? Wow, never heard of it. But I have now and I am anxious to try this. Looks and sounds delicious. Thanks Chuck for your wonderful creations. I’m always looking for new easy ways to make hummus. This recipe does not disappoint. I made a double batch and drained one can of chickpeas and used all the liquid in the other. Also added 1 tble of tahini just to make it a tiny bit more creamy but it was good without it too. Thank you for another keeper. *just realized I completely forgot the garlic * Guess that means I will have to make it again to see how awesome that will make this already delicious recipe. This recipe turned out really well. I made it in the Vitamix and used about 1/2 cup of bean juice (aquafaba) to blend it. I served it to my kids with a huge tray of veggies, which they devoured. I am definitely making this recipe again. Thanks! Chuck – you’ve done it again! Love this so much I can’t stop eating it.